The 1990s proved to be a watershed period in the operation of Britain's railways and the diesel traction especially reflected this. Privatisation took over with its myriad of associated corporate liveries and it's hard to believe that we once complained about the uniformity of the rail blue livery ! Because of the major changes that took place the diesel traction operating in Britain went through a renaissance period and with this in mind we look back at the main line diesel locomotives that were evident during this period, some of which are now technically extinct. 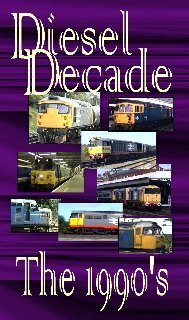 Diesel Decade - The 1990s features all of the types of main line diesel types that featured during the 1990s will be included in the programme. See Class 20s, 26s, 31s, 33s, 37s, HSTs, 46s, 47s, 50s, 55s, 56s, 57s, 58s, 59s, 60s & 66s in action.